Only the lunatic fringe would purposely want to run off stud defensive tackle Gerald McCoy for no good reason. But when you factor in the salary cap and GMC’s age, his position with the team is anything but secure. GMC, who will turn 31 later this month, all but sounded like a condemned man after the season knowing full well with his salary ($13 million), his age and the Bucs’ salary cap situation, the Bucs may just move on from him. Then you throw in the fact new defensive coordinator Todd Bowles may scrap the four-man front, a fixture of the Bucs defense for decades, and some see the handwriting on the wall for the long-time veteran from Oklahoma. So last week in Atlanta Joe asked “The Professor,” John Clayton of SiriusXM NFL Radio, what he would do with GMC given all the factors involved. 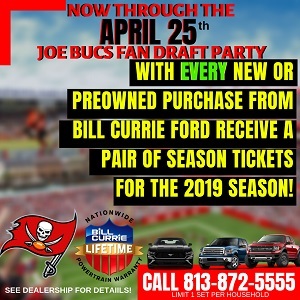 JoeBucsFan.com: With Gerald McCoy, unfortunately, the Bucs are going to have to start counting nickels. He’s on the wrong side of 30. Not sure if his play has slipped or not but with his contract and the Bucs likely in a salary cap crunch, what do you do? John Clayton: I’d keep him. The problem is likely going to be that [defensive coordinator Todd Bowles] will use a hybrid 3-4 defense and now can you really have two defensive tackles? You have Vita Vea, who is real good and is trying to [remain] good but he’s not McCoy. I mean, he has been that franchise. He has been that one guy you really like the most on that defense. So what I am really wondering about is, here is a team that was built to be a pure 4-3. Have the two defensive tackles. Have speed at the edges. Find that third linebacker or have that healthy third linebacker. And somehow, some way, some year, try to find a safety. Some year, somehow, try to find that missing element. Well, Joe understands Clayton was trying to build a case for GMC but instead, sort of made an argument not to keep him. If the Bucs defense was built for a stout 4-3 defense, then the construction was the equivalent of the Three Stooges going into the plumbing business. The defense has been trash ever since former Bucs commander Greg Schiano was jettisoned. So to suggest the Bucs need to keep GMC because that is how the defense was constructed means that house needs to be bulldozed and rebuilt. Joe would lean toward keeping GMC, however, if the Bucs can find a young, dominant defensive end in free agency (please Chiefs, be stupid and let Dee Ford go), Joe would trade GMC’s salary for this defensive end and then go draft this Quinnen Williams, the defensive tackle from Alabama so many people are hot it the pants over. Jason Pierre-Paul, Vea, Williams and Ford sounds like a nice defensive front. Good luck finding a young, dominant defensive end that some team wants to wash its hands of. I like Clayton but wtf has he been watching. We haven’t built sh1t on defense.Our best players were picked up last year in JPP/Nassib in terms of 4-3 lineman. We haven’t built sh1t. If Gerald McCoy has been the franchise – he’s been the worst franchise in the NFL then lol. How is that even a compliment. He’s been the leader of the worst defense in the NFL. woopady f*cking damn do man. you can make a case for either or but the reality is we need good players….GMC is a good player…..dominate…no….great,imo no….but he’s probably the 2nd best dlineman we have on our roster…..
i would try real hard to restructure him 3years/18mil…..draft ed oliver or q williams…..
if bowles can work his magic and get spence to return to at least his rookie form, then a 34 might come sooner than later…. i could care less if its 43 or 34 as long as its effective…. Speed boat Ed Oliver at #5. No where near 30. No where near an $8-$13 million contract. Doesn’t stop going full speed till the whistle blows unlike McCoy who is seen constantly jogging in the wind. Vea was constantly going fast to the ball till the end last year when he got his feet under him. Those two could be nasty in the middle. Its a shame that the decision to patch up the defense and build around GMC was the decision instead of what would have been best for the team and traded gmc for a very “real” offer of 2 second round picks and actually rebuilding for the umpteenth time only to see failure!!!!!!!!!!!!!! This defense needs to be younger and faster with a rebuild, not another patch job!!!!!!!!!! 2019 season will reveal answers to the sheep, that the “real” fans already know!!!!!!!!!!!!!! So many people are “hot in the pants” for Quinnen Williams because he’s the ISHHH. Damn straight, he’s a bad, bad, man. IF somehow that dude ends up on our line, I’ll be one happy camper. Only dude in the draft I’d even contemplate over Quinnen is Bosa, and that would be a ….decision. And hell no, to keeping GMC. And every penny back to us. I think all this worry about 4-3 or 3-4 is overblown. Who was it…maybe Bowles or someone else that Joe highlighted who said that very thing. Most D’s are hybrid anyway. Depending what Bowles saw during the video watching marathon which I suspects continues…he may envision a spot for GMC in his defense…maybe not. Hard to imagine though that he see 13 million worth. I think the player who COULD benefit the most from Bowles is Spence. He came into the league with rave reviews his first two years…bum shoulder and all. Smitty didn’t know how to use him and Smitty didn’t seem comfortable blitzing. Bowles on the other hand will send guys after the QB…if it’s a hybrid formation Spence may get an opportunity. [email protected]$#,actually some smart people around here after all. Quenin and this defense changes its toilet bowl ranking instantly. At the moment, anyone who thinks Q. Williams is going to fall to #5 is extremely naive. And it would be extremely stupid to trade up for him or Allen unless we got multiple picks in other deals. For what it’s worth because of injuries we need depth. Although GMC has been slipping maybe he can work out a friendly contract to play in a rotation, share snaps, or even backup role to Vita Vea. He has been a Buc his whole career. So don’t we owe him at least the courtesy to remain a Buc first? If he can’t except these terms and wants to pursue FA then start shopping or let him go. 13 million is a lot for a guy that gets blown out of his gap all game long. 13 million is a lot for 1.5 tackles a game. 13 million is a lot for 6 sacks a year. Woot! We got our kicker!!!!!!! Phillip Andersen, WELCOME TO TAMPA! John Clayton comes off sounding like he hasn’t done any research on the team here. We have a bunch of useless players on defense. The whole lot of them. The entire defense needs to be rebuilt………especially the Dline. I understand the point that we were built for 4-3 but we are an awful 4-3 team. What arent hurting anything by switching………It’s not like we have 2-3 bonefided 4-3 Lineman who are under multi-year contracts……..It’s the exact opposite…..We could literally dump every single DL on our roster and not lose a penny of CAP space. SOE all.it takes is one QB to go. Then them guys are sitting there at 4(which could get traded for the last QB). Jets are the most likely team to trade out at #3. But wait….what if Williams or Allen are future HOFs? You can’t call that stupid. That’s just stupid. Thinking Allen or William’s aren’t there at #5 would be extremely ignorant by anyone because…have you ever watched the draft? They’ve been trying to build a pure 4-3 defense around McCoy since they drafted him, and it bites them in the a$$ yearly. M o v e. On. Please. He wants to move into acting when his playing career is done. He’s been acting like a franchise cornerstone for years and he’s been box office poison on all but about 2 or 3 plays a game where he’s not getting double teamed into the secondary or flying up field and creating running lanes. McCoys true destiny is in Gotham City. he has player help in nassib and JPP….now he finally has some good coaching….restructure and hope for the best…. Ask yourself and be TRULY honest…. would the Pats have put up with GMC and his sofat as a babies arse ways all these years? And his helping Ben Rothlesburger up after a hard hit? No F… ing way! Belechek would have had one of his assistants show Mr. Cream puff the door before he could say Batman! That’s the difference between Tampa and New England. That and 5 rings! I do not agree that the entire defense needs to go. That would be stupid. If you get rid of them all, there is no way to completely rebuild from scratch this off season and expect it to be any good. Plus, it does not take into consideration the Dead Cap Space that would be wasted. Good teams are built by developing players. That takes time. That’s a lot of spots to fill. McCoy had players around him last year and did nothing. Stop with the he deserves this and that. This is a business he’s been paid nicely for years now it’s time to move on from him and turn the defense over to JPP and let him show these younger guys how to work hard every play. I think if McCoy stays it’s not good for whatever Dlineman we draft because they’ll look to him as the leader by default since he’s been here the longest. Here’s the irony. If the Bucs let McCoy go, and he does well elsewhere…for years we will see all of you blaming Jason Licht for letting him get away. Lol Bonzai you say the whole defense does that have to go then you list 8 defenders you want cut. the. Looking at your FA list I highly recommend to move on from Grimes Conte & Bond. We up to 11 buddy! That’s an entire defense. Yep, that #5 pick better be for defense. Otherwise this regime is just as dumb as the last five regimes. Does McCoy make your defense play harder or softer or neither……… does he make it play to the whistle more, less or neither…….. is he an on the field mental leader , detriment or neither . Does he make those around him better , worse or neither. I hope it is clear NOW !!! His get off is great but that is it , Are We CLEAR !!! Oh yes he would be a great neighbor ( nice guy) if you enjoy people that love the room and conversation to be about them . 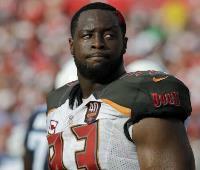 Pay Gerald McCoy $1million dollars per sack of the total average number of sacks over the last 3 seasons. GMC is destined for a great year in 2019. Will it be with Bowles or elsewhere? He is Tampa’s third best player (behind 14 and 13), and a HOF caliber talent. Joe always harps about the Bucs letting talent walk out the front door… hope we don’t do it with GMC. Only the lunatic fringe would purposely want to run off stud defensive tackle Gerald McCoy for no good reason. Count me among the lunatic fringe, but there is very good reason. For years all I heard was get GMC some help and he will ball out. JPP more than filled that need, NAssib was a pleasant surprise. Never saw GMC take control of one single game this year, never saw the leadership on display (unless you count the dance number in Atlanta) and now he wants 13 million for 2019. Hey Bonz, Cross retired but your list is pretty spot on. @Joe … “The defense has been trash ever since former Bucs commander Greg Schiano was jettisoned.” Uhhh, how about we’ve never been the same since Monte Kiffin left town Joe. I’m seeing a lot of emotional arguments for getting rid of GMC, but that’s about it. Some folks talking about getting rid of ALL our DTs EXCEPT for Vea. Duh! Is that the same Vita Vea who missed ALL of training camp & the first few games? Well, maybe y’all would keep Unrein as his backup? Oh that’s right, he missed the ENTIRE season. Well surely we could keep Beau Allen? Oh ya, the player who Webster uses as his definition of PART-TIME. Guess who was on the field more than any DLineman except JPP. Aah yes, Gerald McCoy. Mr Softie to some of you. Historically plays around 80% of the defensive snaps … ya, THAT Mr Softie. To so many Bucs’ fans the grass is always greener on the other side of the fence. UNTIL IT ISN’T! Keep GMC for at least this year (probably another also) because we’ve got too many other fish to fry right now. BUT … to stay a Buc, GMC needs to restructure his $13 mil contract. But do it in such a way that the lower salary corresponds with fewer defensive snaps. That’s been a big part of the issue anyways … Gerald’s pooped late in games because he’s on the field too much. And he’s on the field too much because the rest of our DLinemen weren’t holding up their end. With fewer reps, we’ll see a more productive GMC I’d bet. Stevie T was cut last year. Other than that. ….we didn’t win with them …so why keep em. Quinen will not be there. Pretty much agree with your plan except for one and possibly another player. First off as you point out only save 1,200,000 on Spence and have to eat 647,000 in dead money anyway. Something happened to Spence. He was lauded widely by Jag players in that joint practice a couple of years ago. The Jags with their own stud defensive players thought Spence was the next big thing. Not to pile on Smitty but do we think he used Spence properly? I’d like to see what Bowles can do with him. If Bowles has seen enough video and wants to cut him I’m ok…but it should totally be a talent decision his salary is not that much. Kwon? If he could return to his former self after that blown out knee perhaps. Like many here though I’d rather see him as a OLB not an MLB. If we keep him it means Bowles thinks he can play and that’s enough for me. All the rest I agree with. Doesn’t GMC deserve some piece of credit for the sack-cess of JPP and Nassib? What happened to the conventional wisdom that the impact of good DT play shows on the DE’s stat lines? Gerald needs to humble himself, realize he’s been paid too much based on results, and restructure his contract at a number that helps the team. I still think this was his best season and I begged for them to trade him before the last draft. But now is the time to keep him. Todd Bowles will make him better and more productive. Keep him at the right price. Apparently you did read my entire post. Grimes Conte & Bond are all on the ‘off the books’ list. Not the re-sign list. Do I need to point out the ones worth keeping? There are a bunch of them. For example…we do not need Curry because Carl Nassib is better. No point in paying $8m to Curry to be a backup. At linebacker we would still have Kwon, Alexander and Cichy. At CB we would still have VHIII, Davis, Smith and Stewart. At Safety we would still have Evans and Whitehead. Dline would be JPP, Nassib and Vita Vea, plus a drafted DT if we stick with 4-3…or we could restructure GMC. Out of all of those, we’d have the starters covered except for McCoy’s spot. That is hardly a complete rebuild. Upgrades? Well a team should always be looking to upgrade through the draft…it;s cost effective when you have the right starters. You make a great point. The haters main argument against McCoy is that he did not make the rest of the line better. Now that he has, they still are not pleased. I would argue that he is normally pretty humble. It’s easy for us to say he should restructure, but the truth is the rest of the league respects him immensely. While other players might not get respect, he does. A team would gladly pay him that much for 1 year or two, and these days, aged veterans play year to year. Could you imagine what McCoy would do on an established Defensive Line? Our line is coming along. JPP is solid. Nassib had a good year, but his next year should be incredible…especially under Bowles. We actually have the right talent for a 3-4 line…it just needs some adjusting position-wise. If McCoy and Kwon and Lavonte are so good, how come this team hasn’t won? No sacred cows. Bottom line is it’s time to move on in general. The locker room and the team should be excited for change, so should McCoy and he should be ready for change to a different team. Agreed. They sent Sapp packin at the end of his career. Sapp got 10 sacks one of the four years he was in Oakland but that was about it. And GMC sure as hell aint no Sapp. HE should’ve retired as a Buc.